Home » Model Horse	» BreyerFest Copacabana – The Sneak Peak Is Revealed! 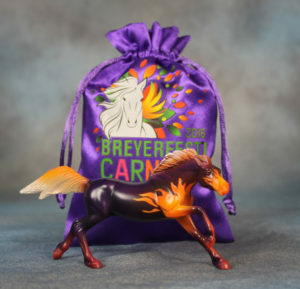 BreyerFest Copacabana – The Sneak Peak Is Revealed! But now the mystery is solved! The horse’s name is Copacabana. He is the Breyer Stablemate G3 Mustang that was sculpted by Jane Lunger and is a neat decorator color that comes with his own festive bag. 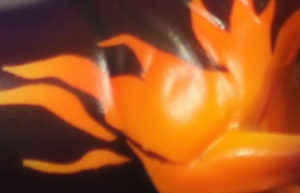 He appears to be a dark purple with flames. He will be available in the Breyer Mercado which means I won’t have a chance at him. Drat! Breyer has this to say about him. Copacabana is named after one of Brazil’s iconic and beautiful beaches that will host parts of the 2016 Olympic Games. He might be small but his fiery coloring makes him fierce and larger than life. This unique mustang was sculpted by Jane Lunger and originally released in 2006. Pick up your very own Copacabana in the Breyer Mercado all weekend long! Check out some more of our exclusive BreyerFest models and where to find them here! I do still have a number of BreyerFest 2016 Exclusive Models available for Presale. 2 Responses to BreyerFest Copacabana – The Sneak Peak Is Revealed! « Indian Pony Exclusive Test Piece For Collector’s Club Members!